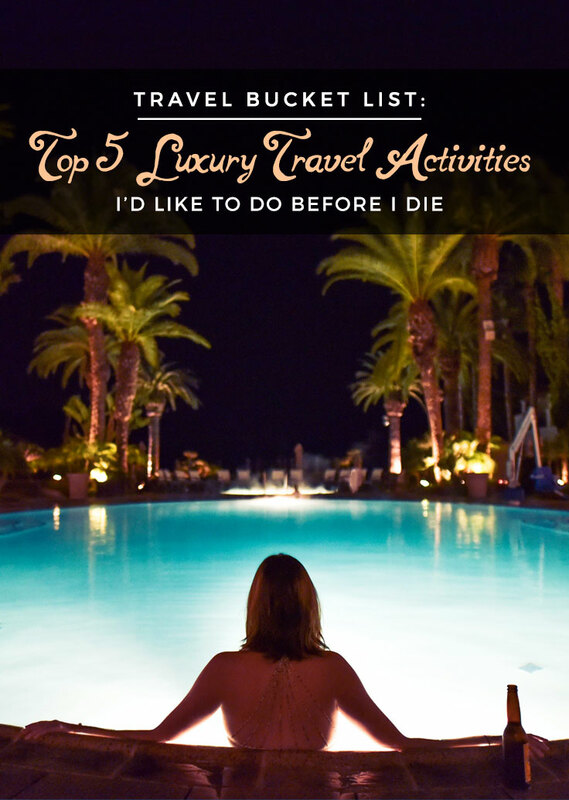 What are the luxury travel activities that are on top of your bucket list? I said ‘thought-provoking‘ because this kind of query warrants careful consideration — there are simply too many luxury travel activities out there that are amazing in their own way! With that in mind, coming up with a top 5, for instance, would be such a pain. But we all have an obsession for bucket lists, don’t we? And I absolutely don’t see anything wrong with that, unlike what others may seem to preach. Besides, it actually helps us streamline our ‘wishes‘ better; most especially when you’re the sort of individual (like me) who has constant jumbled thoughts and an innate struggle to play favorites. Let’s not forget the fact that a bucket list can even serve as an inspiration for others too! It’s no news that Africa is high on my ‘must see destinations‘ list; therefore if I were to make this dream come true, I would LOVE to go through an ultimate safari experience! Aaah… I can just imagine how epic it would be: a stay in a secured but isolated luxury lodge / camp that will give me the utter bliss of being at one with nature. As the days drone on, there will be tons of opportunities to try unique daily itineraries with specialized guides who will take me on an adventure through the wilderness and even through local communities. It will truly be an experience that perfectly mixes the sophistication of luxury travel and the raw beauty of the safari wilderness! Every fiber of my being would like to say goodbye to long airport security queuing lines, to the hassle of connecting flights, to noisy flight seat mates — to basically the whole idea of flying on a commercial aircraft! After all, every single one of us knows how amazing it can be to fly on a private luxury jet charter… Just imagine the privacy, the comfort, and the personalized kind of flying experience that you can get. Couple that with a getaway to an exotic destination (like the Galapagos Islands, Bora Bora, Easter Islands, etc.) then that would be a trip that would be hard to forget! Go on a round-the-world cruise — in style! I love staying in luxury accommodations, I love the sea, and I also love to travel the whole world. So how about mixing all of that into one luxury travel experience…? And that’s how a world cruise comes to mind. Besides, as a girl who grew up with Disney movies as well, this would be like the adult version of making my ‘mermaid’ dreams come true: living in the ocean in a luxurious environment. I can already picture how blissful it would be to dock to one country after another, as I slowly make my way around the globe in luxurious comfort. For a ‘micro level’ of sea adventures, I would also like to try a more private experience such as having a yacht of my own that I can sail around with (since I’m not experienced with sailing, and this is about luxury anyway, then an experienced skipper should be included!). For sure, the Mediterranean waters and its breathtaking islands would be a good start for my luxury sailing spree as I gain all the freedom to go to wherever and whenever I want to! The breathtaking beauty of the northern lights is a must to see. Truth be told… seeing it with your own naked eyes is already a luxury in itself! But to kick it up a notch higher, I wish to be able to view this nature’s wonder under a unique and luxurious glass igloo. I’ve seen posts around the internet about how there are several luxury resorts in the Nordic region that offer glass igloo rooms or lodges, and certainly, this is an experience that I would not want to pass on — and which you shouldn’t as well! I fervently hope that these ‘vacation fantasies’ would soon be checked off my bucket list. But then again, I’ve made a lot of travel dreams come true so far ever since I started this travel lifestyle… and I have a feeling that I’ll soon be checking these off too! We’ll see how it goes. For now, I’ll be keeping these top 5 in mind — you should too! DISCLAIMER: This post was written in collaboration with Air Charter Service. What do you think of my top 5? What would be your top bucket list luxury travel activities? Or have you already ticked off one of your top-listed luxury travel activities? What was it? Thanks Bella, hope you get to make your bucket lists come true too! ;) And thanks for following me on Snapchat. I'll keep you guys updated! I love freediving and i always wanted to sail around even though it's not a yacht. I'm 100% with you on all of these! Especially seeing the Norther Lights in a glass igloo!